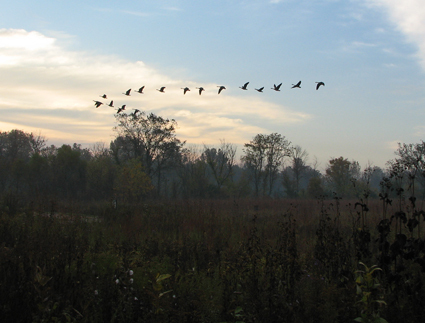 Have you ever been outside and heard the sound of wild geese flying overhead? What a wonderful sound that is. Their “honking” makes my head snap back immediately as my eyes scan the skies for these beautiful birds. Then I see them, flying in formation like a huge “v,” for victory, in the sky. It’s a beautiful sight and sound! 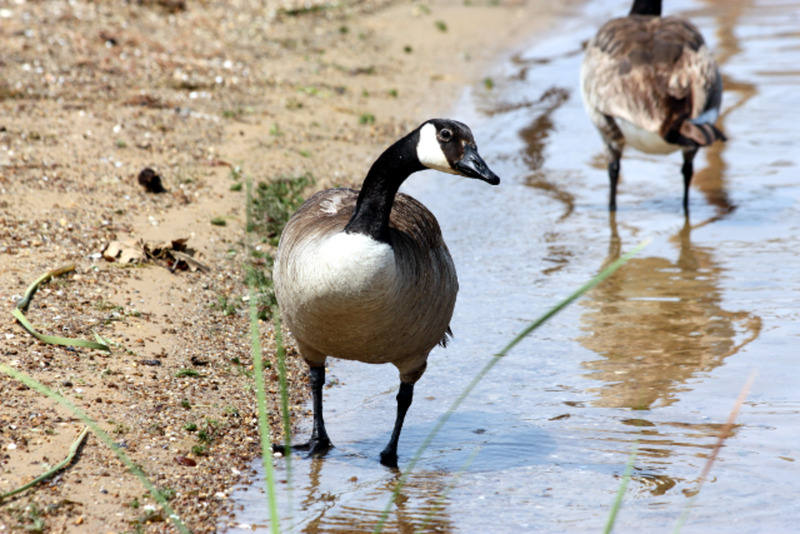 Once threatened with dwindling populations, due to over hunting and the loss of their habitat, the Canadian Goose, (Branta canadensis), is now one of the most common birds in North America. In the 1950s it was believed that the Giant Canadian Goose, a larger subspecies, had become extinct until a small flock was found in 1962, in Minnesota. Now with better game laws and preservation improvements, the numbers are climbing again. With the declining numbers of natural predators and year around food sources in milder climates, some of these naturally migratory birds have decided to take up residence in warmer areas year around. 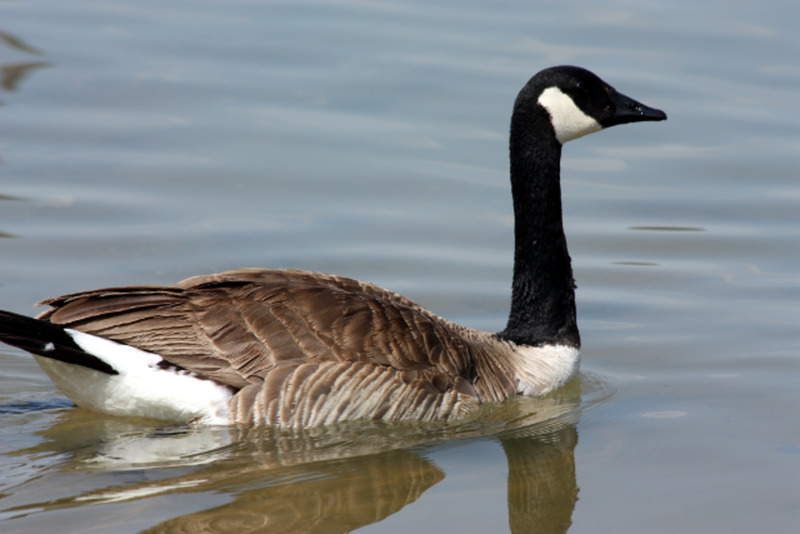 There are at least eleven subspecies of the Canada Goose. Typically, the species get smaller, and you move northward and darker as you move westward. The four smallest forms are now considered to be a separate species called the Cackling Goose. They are all distinguished by a black head and neck with white cheeks and chin strap. They have a long black neck, tan breast and brown back. 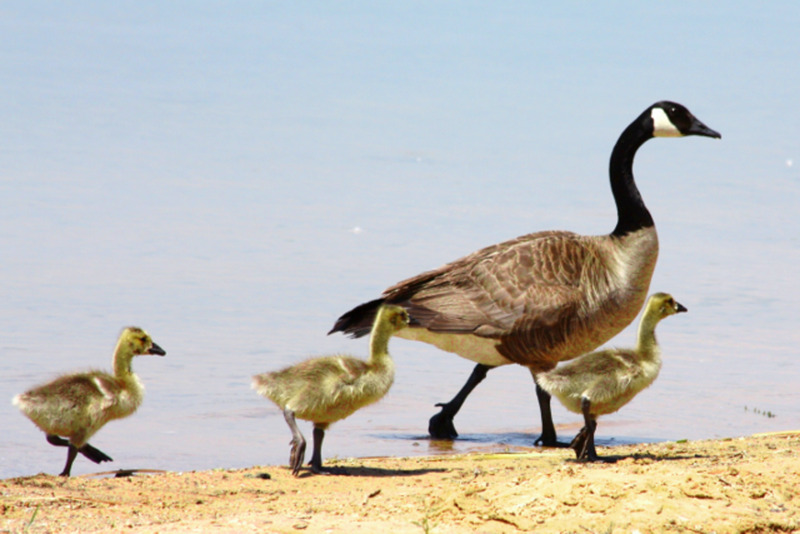 The largest of the Canada geese is the Greater Canada Goose, which is also the most common. 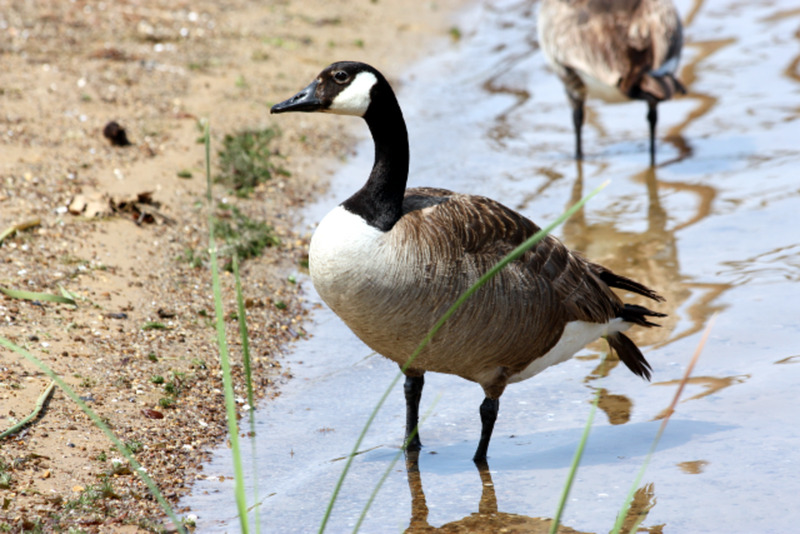 The Canada goose can weigh between 7 and 14 pounds with a wingspan of 50 to 71 inches. The male and female look extremely similar and the only way to visually tell them apart is that the female is slightly smaller. 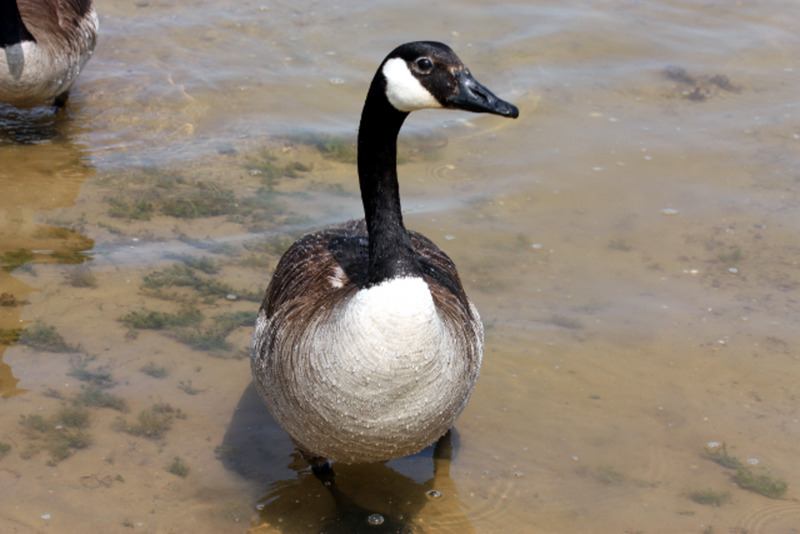 The Canadian Goose is native to North America and breeds in Canada and the northern parts of North America. 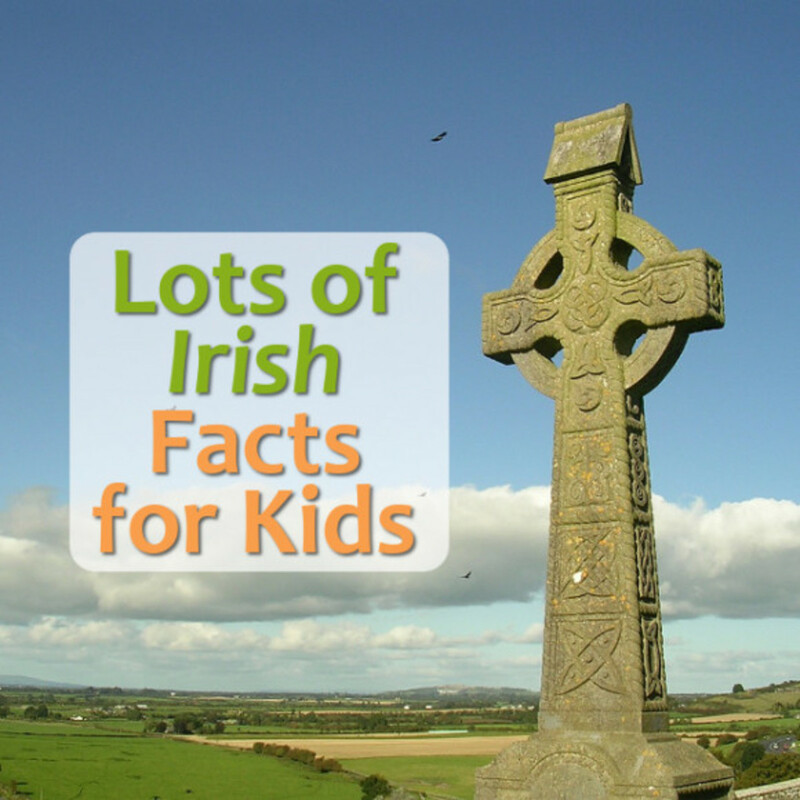 They have been found in every contiguous US state and Canadian Province at one time or another. 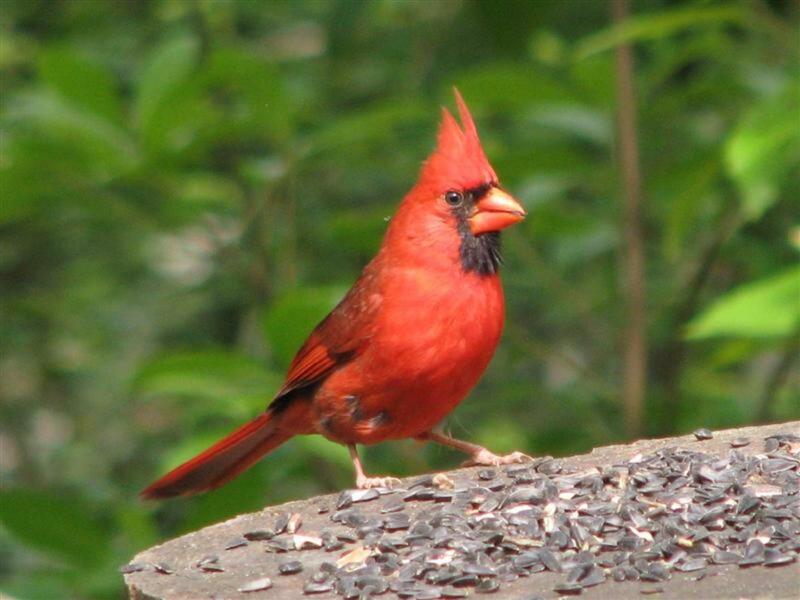 They nest in areas near water sources such as lakes, streams, and rivers. They normally elevate their nest in order to keep an eye out for predators. You can sometimes find a nest on top of a beaver lodge. Canada Geese are particularly fond of lawns. The can easily digest the grass, and manicured lawns give them an unobstructed view of any approaching predators. They seem to be becoming very fond of golf courses, parks and some airports where they are not only becoming pests but can also be very dangerous. 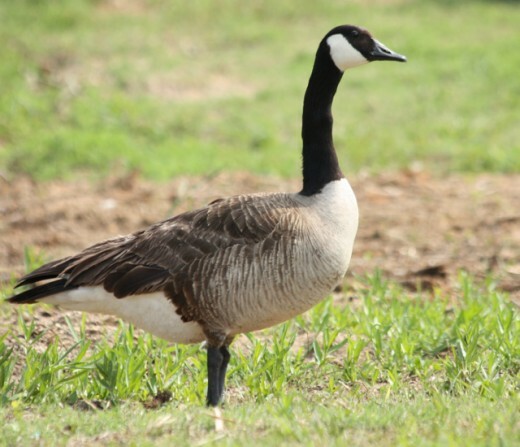 In recent years the Canada Goose population has grown to the point that they are considered a pest due to their droppings, noise and sometimes aggressive behavior. I have a friend in Colorado, who lived in an apartment complex for a little while. One day and as she came out her door, on her way to work, and was met by a very defensive mother goose! Apparently, this mother goose had laid her eggs in a raised flower bed just across from her apartment door. The new mother goose wouldn’t let my friend come out her front door. She had to call the maintenance man to help fend off mother goose with a broom so that she could get to her car. This went on for days until mother goose decided she wasn’t going to be a threat and began to let her pass with just a warning “hiss.” An angry mother or father goose, protecting their young can be quite frightening. 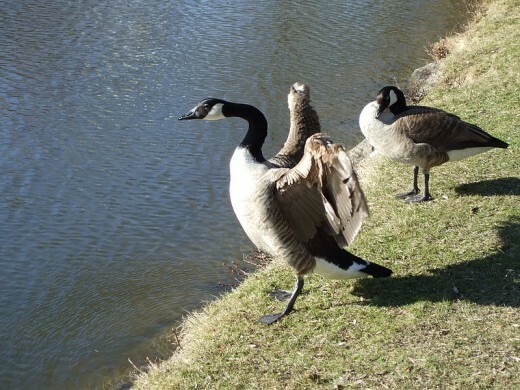 The Canada Goose is herbivorous and feeds mainly on grass, aquatic plants, sedges skunk cabbage leaves and eel grass in the spring and summer. They will also eat small fish and insects. In the fall and winter, they tend to feed on mostly seeds and berries. They are known to be especially fond of blueberries. They are known for their skill at removing the kernels from old, dried corn cobs. In many areas around public lakes and parks, you will find they have become somewhat tame and will take “treats” such as a piece of bread from people who choose to feed them. Please be sure to remember that they are still wild animals are can be very unpredictable. 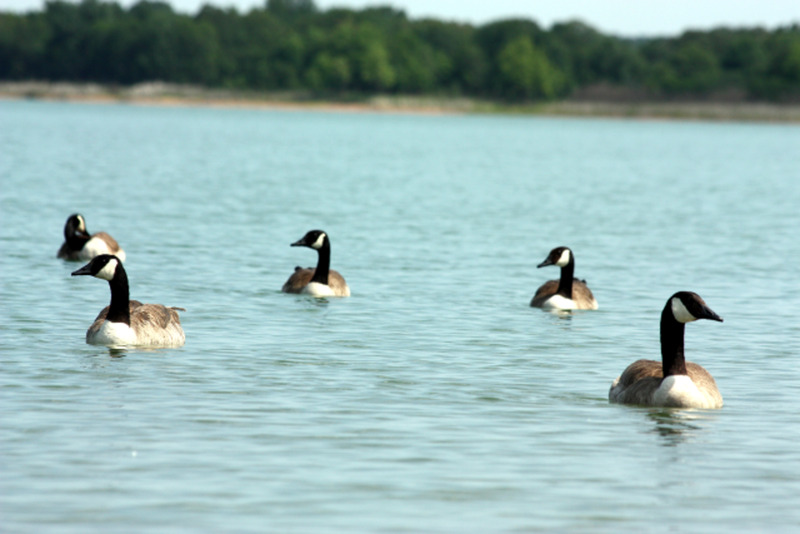 Canada Geese are known for the seasonal migrations. During their fall migration, which is usually from September to November, they are returning to warmer climates in the southern areas of the United States such as Florida and Texas. Their spring migration will take them back to the northern areas and into Canada. The Canada Goose is well known for their V-shaped flying formation. This formation is rotated between certain geese as it takes more energy to be the leader. The others follow in the v-formation, conserving energy. 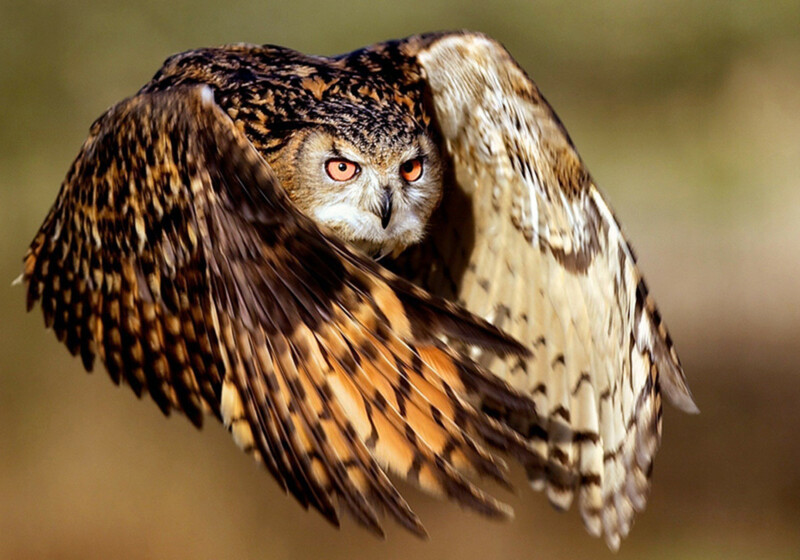 They can fly up to 1,500 miles in one day, but usually, fly at a more leisurely speed. Their “cruising” speed is about 30 to 40 mile an hour, but if in a hurry, they can fly up to 60 miles per hour. 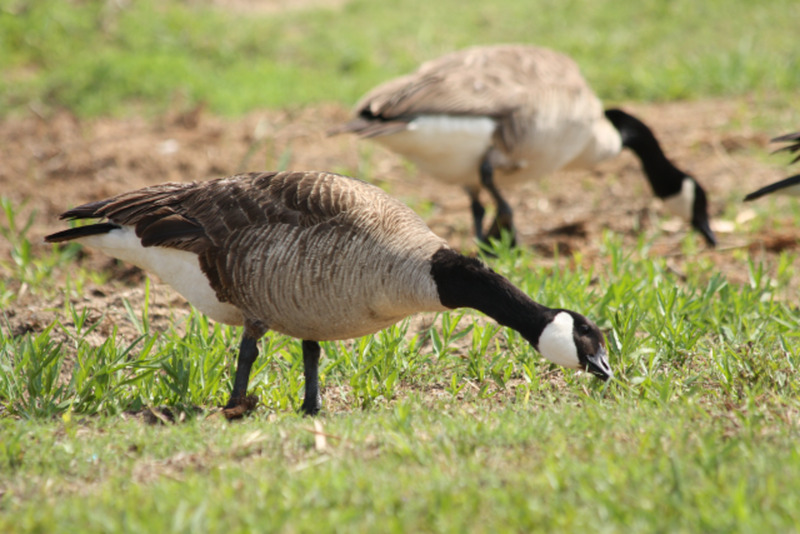 The Canada Goose will normally return to where it was born to nest. They often will choose the same nest they left the year before, if available. 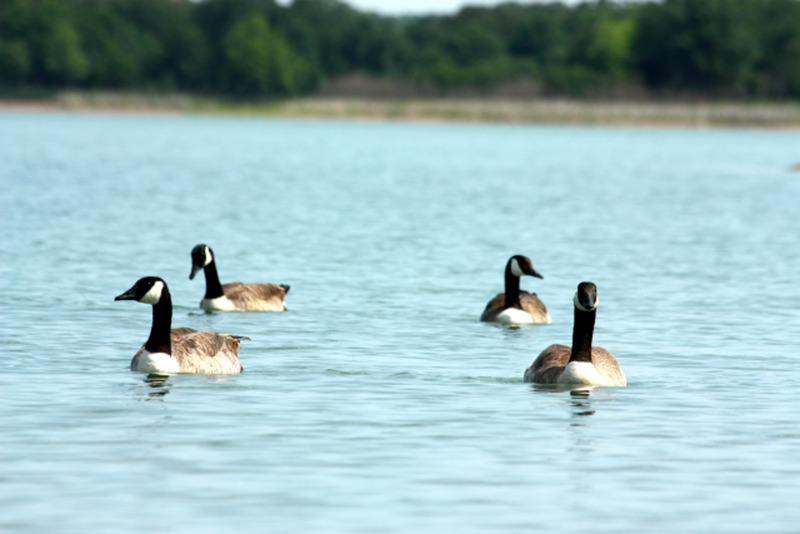 When the Canada Goose becomes two years old, they will begin looking for a mate. They are monogamous and will normally stay together for life. If one of the mates dies, the other will choose a second mate. The female will lay between 3-8 eggs, and both the male and the female will protect the nest. 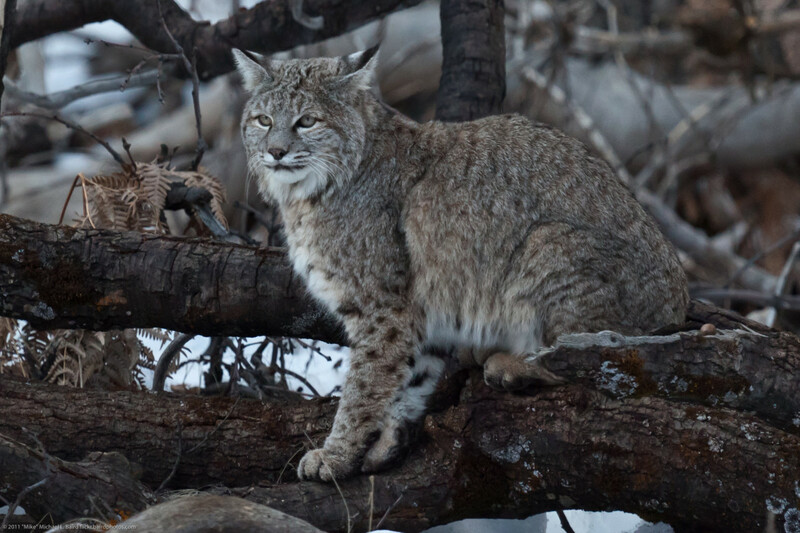 However, the female does spend more time on the nest as the male stays nearby for protection. The nest is made up of grasses and down feathers. The female will pluck the small down feathers from her breast and lay them around the inside of the nest. The eggs normally hatch after 24-28 days. 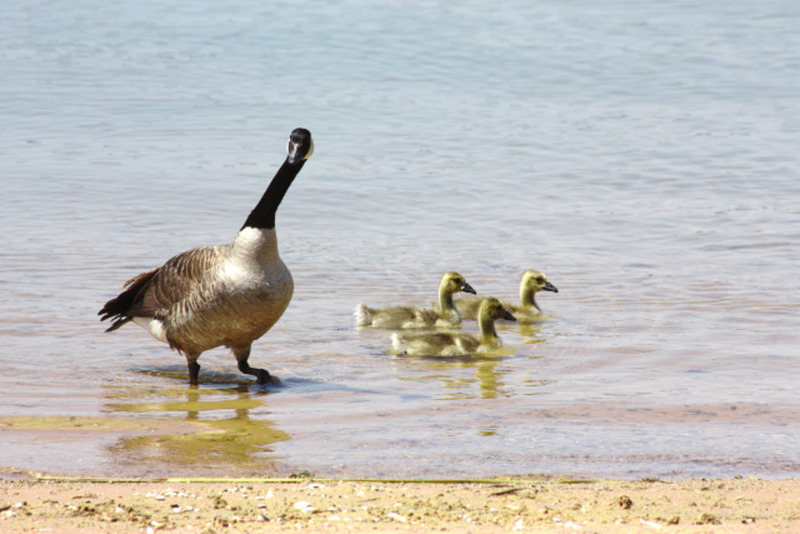 During the incubation period, the adult geese will molt, or lose their flight feathers in order to get new ones. During this period they cannot fly. They will get their new flight feathers well before fall migration, and this is when they teach their young ones to fly. The goslings are light yellow in color with greenish-gray heads until they obtain their adult plumage at about 3 to 4 months old. 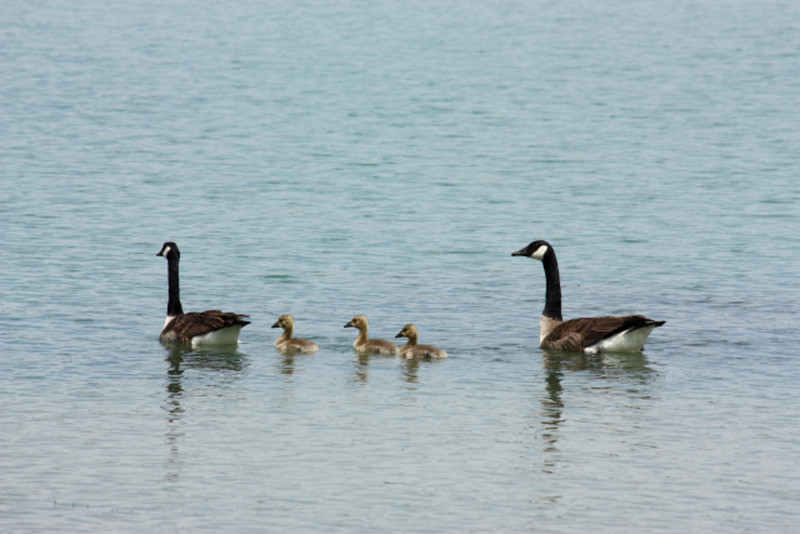 You will see the geese moving around as they are feeding with one of the parent geese leading the goslings in a line. Normally one adult in the front and another in the rear. This is to protect their goslings from predators. The young will stay with the parents for up to a year. 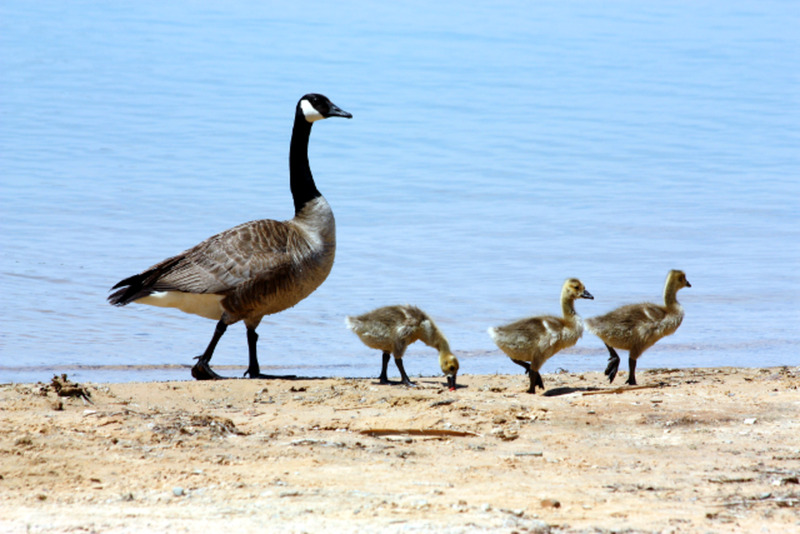 Once the Canada Goose reaches adulthood, they are usually not preyed upon, except by humans. 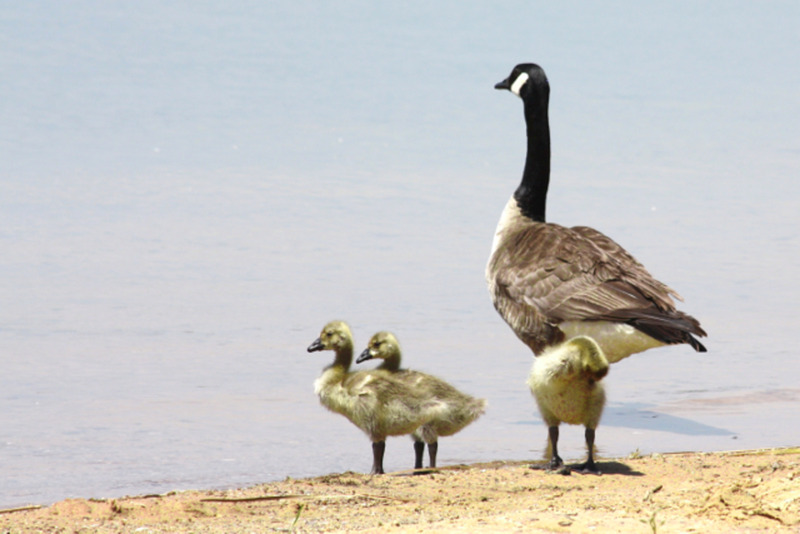 Normal predators of the goslings are coyotes, foxes, eagles, owls, and hawks. Raccoons and bears will often prey on the eggs. Both the male and the female will protect their young at all costs. Spreading their wings, honking, and hissing at anything that comes to close. 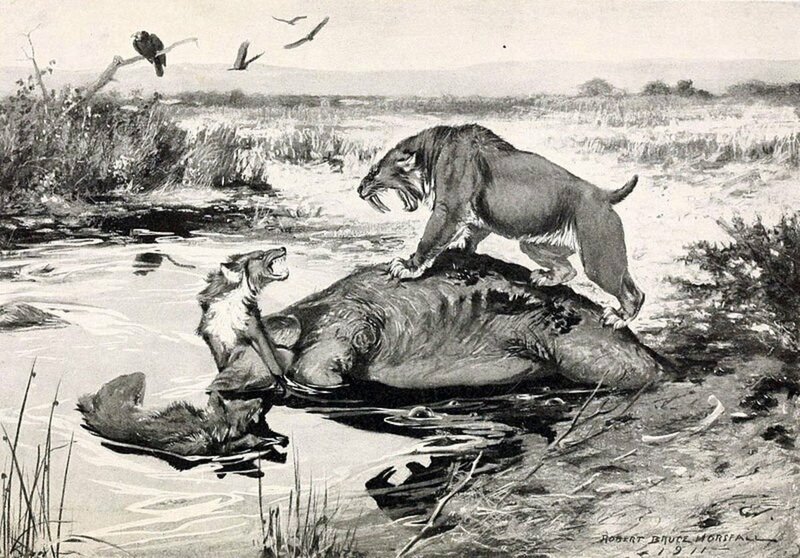 They will attack and bite at the predator until the chase it away or die trying. Their average lifespan is 24 years. However, there is a report of a Canada Goose which lived to be a little over 40 years old in captivity. 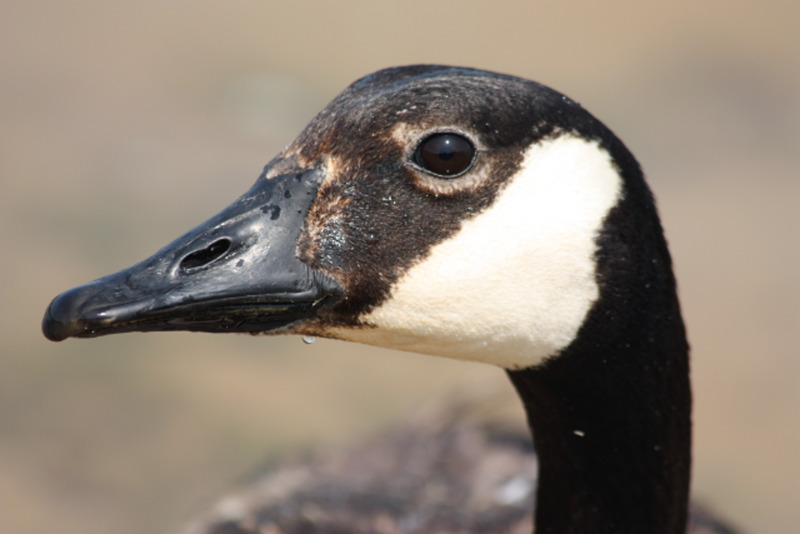 The Canada Goose has at least ten distinctive calls, and the female has a lower voice. They also have excellent eyesight and can see 180 degrees both horizontally and vertically, which is very helpful in flight. 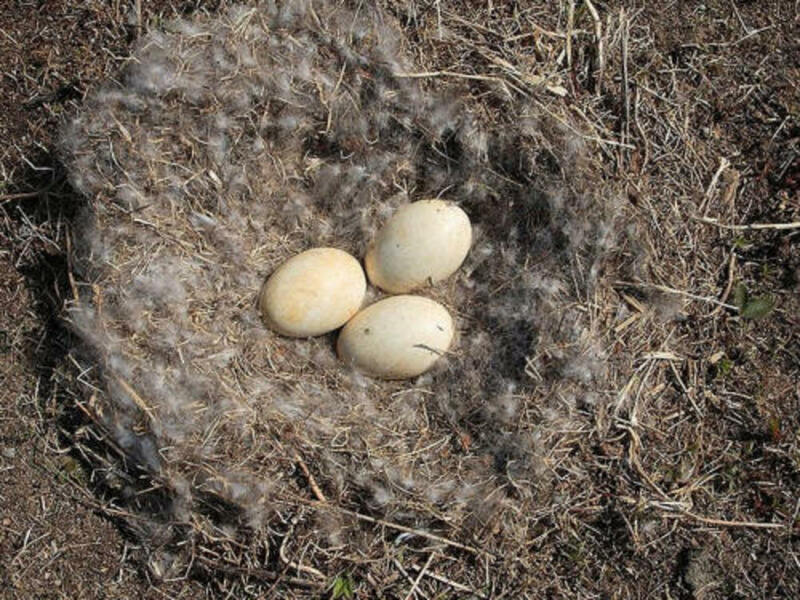 It has been said that after a late spring snowstorm in an Alaskan breeding ground, once the snow melted away, there were geese found, frozen to death, still sitting on their nests, trying to protect their eggs from the cold. 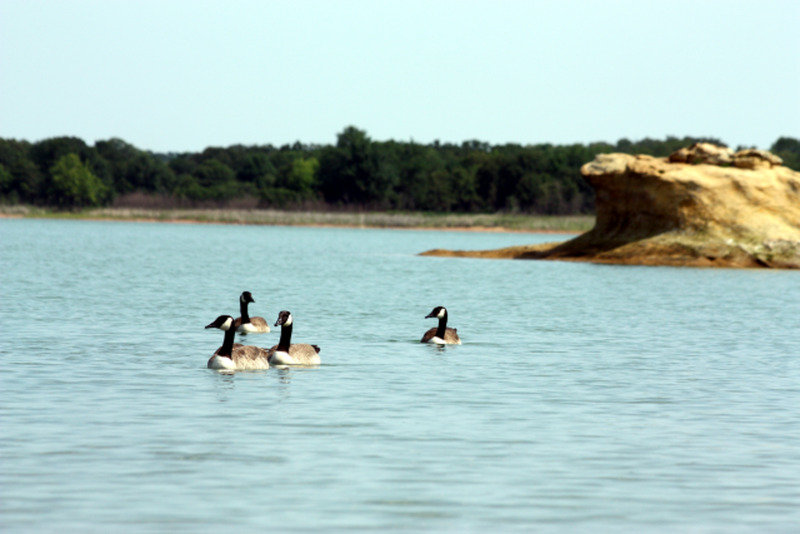 Do You Have Canada Geese Visit Your "Neck of the Woods"? 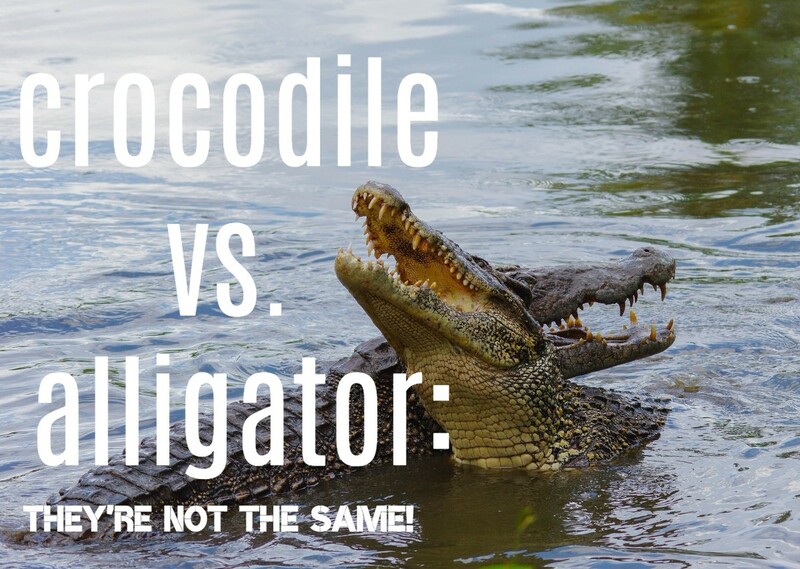 Sometimes animals have rather unusual names. Below is a list of some amusing animal names. The list contains their names as males, females, babies and groups. I really found this rather interesting and sometimes really funny. My pleasure Sheila. When I used to live in New Jersey, I saw Canadian geese by a local lake with some ducks and swan. You too! Thank you, Kristen! I'm so glad you enjoyed my hub and I appreciate your kind comment and vote! Have a wonderful day! Sheila, this was an interesting hub on Canadian geese and a beautiful one too with those photos. Voted up! I'm glad you get to enjoy watching the Canada geese too, Susie. Thanks for stopping by and have a great day! Thank you! I'm glad I could bring back such a pleasant memory for you! I enjoyed you sharing that memory with me and I'm sure your grands remember it well! Thanks for stopping by and have a wonderful day! Yes, we do have Canadian Geese here in northern Minnesota up by the Canadian border. Lots of them, and I love watching them, Sheila. I was interrupted in reading this before and now am through the interesting facts. Such amazing creatures! I have a special memory from last spring because I took a little country hike with four of my 3-6 yo grands up in the top of Washington state. They we lined up, youngest closest to me and oldest holding rank at the back. We had to stop for the youngest to rest a minute when geese flew over, low and headed to a nearby lake. I was occupied and wouldn't have noticed except one honked above my head. I looked up amid the busy bedlam of the moment and shouted, "Hellooooo goose!" The little grands thought that was so funny that they almost fell to the ground laughing. I now smile out loud when I see geese. Thanks for the details and the reminder of this memory. :) And now I know that they could see us very well! I have heard it said that on occasion hummingbirds fly south on the backs of Canada geese! Any truth to that? Don't worry Shyron, I appreciate your effort and your comment here! Have a great day! Sheila, I love this, I love pictures of geese. 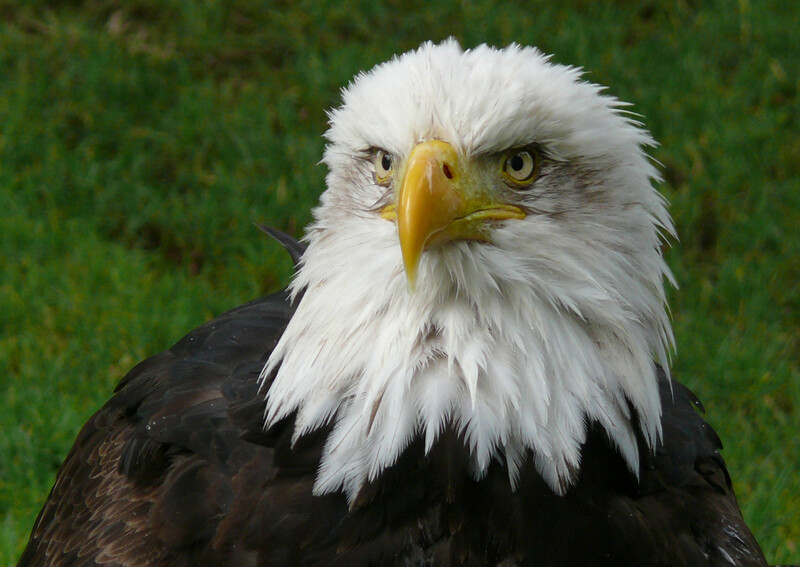 I love the picture where it looks like a head scarf slid down under the beak. Voted up, UABI and will share. Earlier today, I was answering a comment to you and my computer hiccupped and I had to reboot, when I did you comment was gone. I am so sorry. I don't remember the article it was on. Thank you very much for this detailed hub about the Canada Goose, Sheila. I love your photos, too. Canada geese are very common where I live. It was great to learn more about them by reading your article! I so enjoyed this hub. Ohio is one of the places Canadian geese like to land and stay and stay. Ours here in Ohio are rather tame and bold sometimes. We are constantly stopping the car and waiting for a line of them to walk across the road. Some people have been known to actually get out of their cars and direct traffic around the geese. They are not too noisy here or in the sky over Ohio. I don't know why that is other than we Ohio humans and the geese get along with one another quite well. Thanks so much for your interesting and informative article! Your photos of them are wonderful also. Love them....it is an awesome sight and sound as they make their way to wherever. How can you not be enchanted by them? I learned so much here, Sheila. We had geese when I was a young girl and truthfully I do not know what kind they were. I do remember they would chase us and peck our behinds if we strayed into their zone!!! Sending Angels your way this evening. They quite often fly overhead during their migrations and land in some rice fields west of Houston. They can be aggressive! 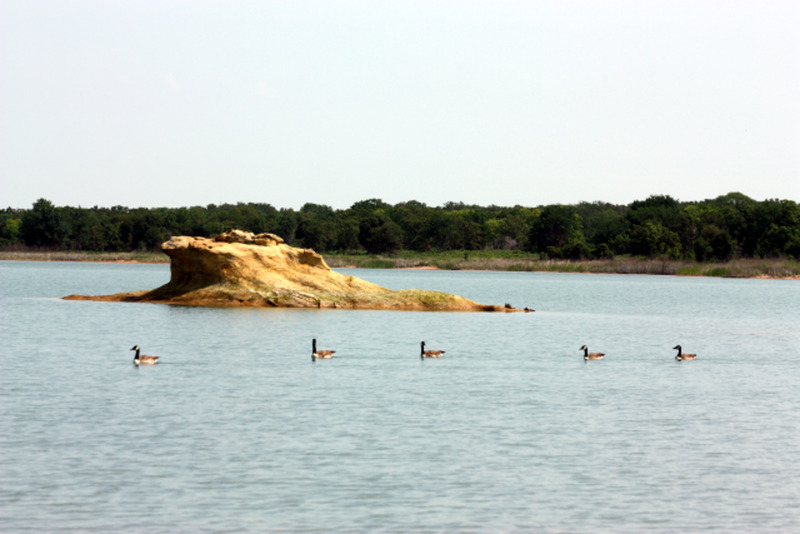 I well remember retreating to the car when a couple of geese came swimming out of DeGray Lake in Oklahoma and seemed a bit too threatening for me to stand my ground. I got some pictures prior to my retreat. Ha! I had no idea that there were so many subspecies of geese. UUI votes and sharing. Very interesting. Thank you, Sheila! 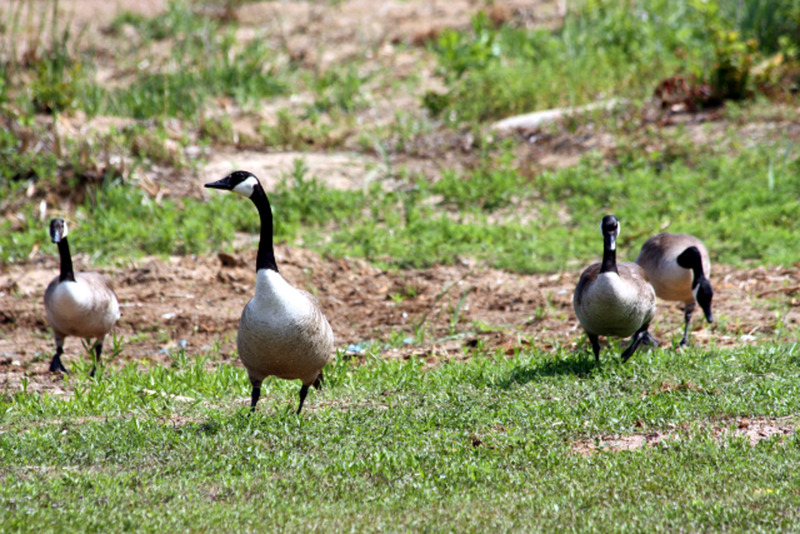 In the spring there will be Canadian Geese in the field across from our house. I love to watch them I know some people don't like them but I do. My parents tame goose once bite me, it hurts and there was no way I could get away from him. He was determined to bite me. I love that sound and that parade as they fly over. I would hear it and know that a chill would soon follow. I did not hear any this year...maybe I missed them which saddens me if it is so. I look and listen for the geese every October and March. The last several years we have had a resident flock of geese that have wintered over. I suspect the warmer climate has had something to do with that. There is a large pond just over the hill from here as well as a large pasture or two. Thanks for all this good information about Canada geese. I learned a lot and voted Up, Useful and Interesting! Thank you so much for sharing this wonderful hub. I love anything to do with animals/nature etc.and this one was indeed a treat. I've always admired Canadian guese and enjoyed their honking as they travel in V formation. I didn't realize that there are 11 subspecies! They'd have to fight me for the blueberries. : ) Very interesting, thanks! It is so interesting learning about the Canada goose. Haven't seen them though as they probably don't fly so far out as where I live. They are lovely creatures with a fiercely guarding nature towards their offsprings. Good job, sg! My group at Boomer Lake is settling in and choosing mates. Goose Island is getting ready to be rather noisy quite soon. Any activity in your area? Very enjoyable and well-researched article on Canada Geese! 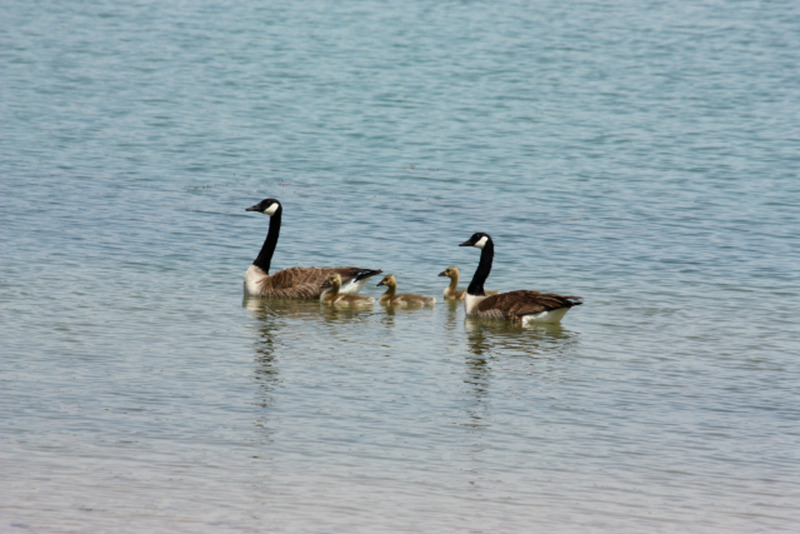 We have many of these geese year around where I live, and I always love to see the goslings with their parents. When visiting our son in New York State, there are Canada geese living on a pond in front of a Walmart on a busy road. We've seen 4 lanes of traffic stopped several times to let the family of Canada geese cross the road with the female leading the way and the male guarding the rear. Great article. We have Canada's in Britain, and while they're not native to us, I do love hearing them honk as they fly over my head. I also admire the devotion to parental duty- I say this because I remember a gander went for me as I walked past him and his family down the park path. He well and truly taught me a lesson. I got interested in geese last summer and got one saved with a broken wing. They really are entertaining. I missed a fabulous shot of about 15 or 20 coming in for a landing and can't wait to rectify that come spring. Interesting hub, thank you. Never have seen one but now I have. Well put together and I always enjoy learning something new. Thanks for sharing all this. UP.